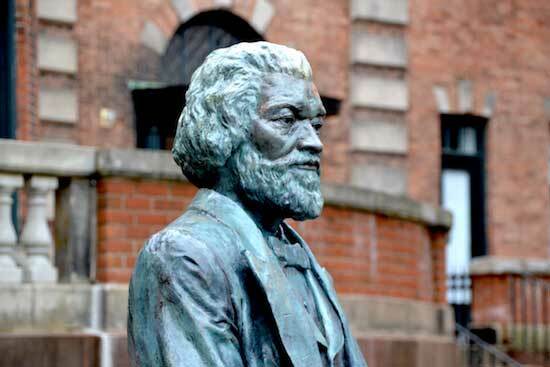 ROCHESTER – The City of Rochester last year unveiled 13 statues in honor of Frederick Douglass during the 200th anniversary of his birth. These photos of one of the Douglass statues were taken on Jan. 8. 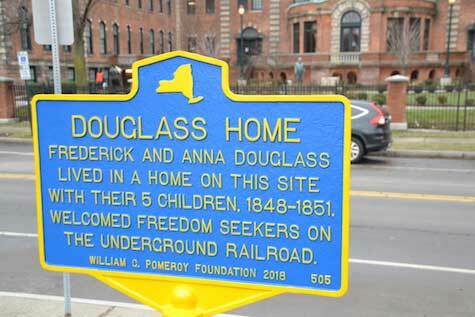 This is at 300 Alexander St., which is near the site of Douglass’s first home in Rochester at 297 Alexander St. File photo by Tom Rivers: The original bronze statue at Highland Park was created by Stanley Edwards and is up high on a pedestal. These statues are very similar to the one at Highland Park in Rochester. That statue, unveiled in 1899, was the first statue erected in the country in honor of an African-American. Douglass was born a slave in Maryland in 1818. He escaped the South at age 21 and moved to Rochester in 1847. He stayed for 25 years. “At any rate, seeing that the male government of the world have failed, it can do no harm to try the experiment of a government by man and woman united…” Douglass said then. 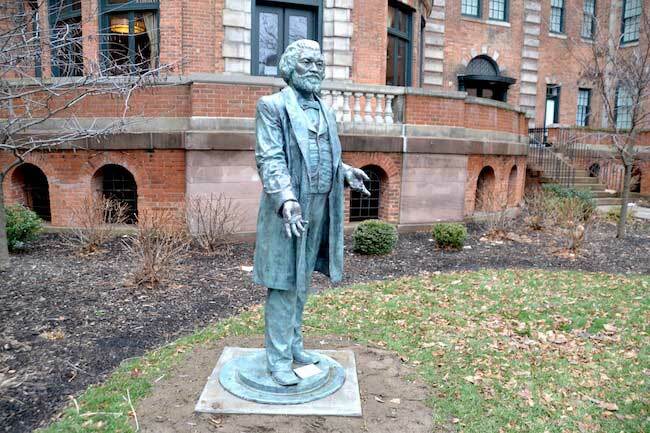 The new statues of Douglass were created by Rochester sculptor Olivia Kim. The statues are placed at sites around the city that are significant in Douglass’s life and his work as an abolitionist. Douglass, as a crusader, made Rochester a focal point of the abolitionist movement. He published the North Star newspaper in Rochester and coordinated Underground Railroad efforts in the area. Frederick Douglass was one of the most famous Americans during the 19th Century. Douglass lived in the city until an unexplained fire at his home. He then moved to Washington where he worked for the Garfield and Harrison administrations. He died in 1895 and Rochester moved to honor him with the bronze statue. 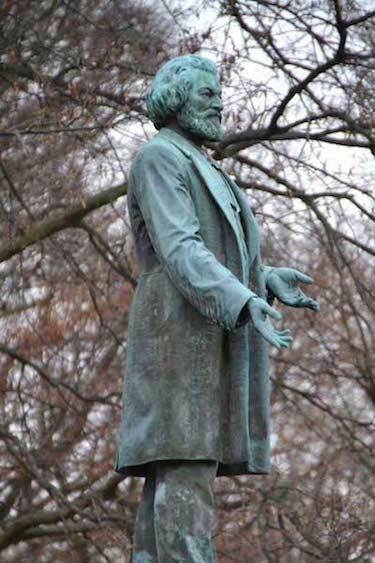 It was created by sculptor Stanley Edwards, who used Douglass’s son Charles as a model. When it was unveiled in 1899 in front of New York Central Train Station, it was the first statue dedicated to a black man. The dedication ceremony for the Douglass memorial was attended by 10,000 people, including Theodore Roosevelt, who was then New York’s governor. The statue was moved to Highland Park in 1941. Rochester officials didn’t think the spot by the train station at the corner of St. Paul Street and Central Avenue was a fitting location for one of the city’s most respected residents. That site was noisy and grimy. The new statues were part of the Frederick Douglass Bicentennial Commemoration. 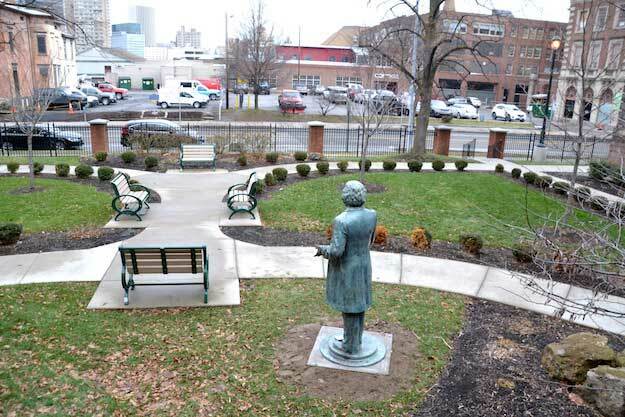 The project aimed to better connect Douglass to the community, to bring him down to the ground where more people could interact with the statues. Kim, the artist who created the new sculptures, softened Douglass’s stern look and tried to present him in a more relaxed pose. Kim used the hands of Kenneth B. Morris Jr., the great-great-great-grandson of Frederick Douglass, as a model for the new Douglass statues. This new Douglass statue is at 300 Alexander St.
A historical marker was erected last year across from 300 Alexander St., where there is a new Frederick Douglass statue. • 300 Alexander Street, near the site of Douglass’s first home in Rochester at 297 Alexander St.
• Intersection of Alexander Street and Tracy Street, which was the site of the Seward School attended by Douglass’s children. 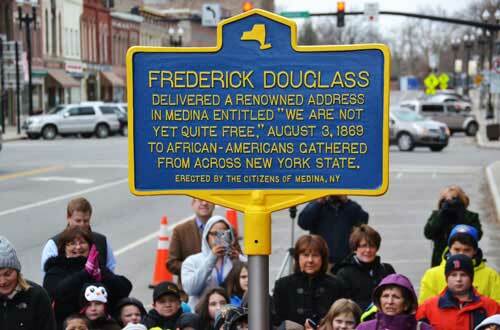 Medina unveiled a historical marker for Douglass on Main Street in April 2015. The Orleans Renaissance Group and Village of Medina on April 25, 2015 unveiled a historical marker in honor of Douglass on Main Street, in front of the Knights of Columbus. The historical marker unveiled today on Main Street in Medina highlights two speeches he gave in Medina. In 1849, Douglass delivered a speech in Medina at the former Methodist Episcopal Church on Main Street (the current Fuller block, home of Main Street Appliance). He also visited Medina in 1869 and gave a celebratory address for Emancipation entitled “We are not yet quite free.” That event on Aug. 3 was attended by African-Americans from throughout the state.